The SS Ohio enters the Grand Harbour under the control of dockyard tugs and with HMS Ledbury still secured to her side. A salient chapter in the history of Malta and World War II was written 75 years ago when five of the 14 ships in Operation Pedestal entered the Grand Harbour in August 1942. The island was in a dire situation – about to surrender to the Axis powers – but was saved by the food supplies, fuel and hope the convoy brought. Scenes of jubilation surrounded the Grand Harbour 75 years ago as many Maltese, battered by the war and famished, flocked there to see with their own eyes the arrival of the surviving ships of Operation Pedestal. There was dancing and singing in the streets as the first of three merchant ships in the convoy – the Port Chalmers, Rochester Castle and Melbourne Star – entered the Grand Harbour on August 13. People cheered at every vantage point and the Royal Malta Artillery band played music from the ramparts of Fort St Elmo. The same scenes accompanied the arrival of another merchant ship, the Brisbane Star, as she made port on August 14. But it was the arrival of the tanker SS Ohio on August 15, which carried tons of fuel, that was celebrated most. “There were scenes of mass hysteria as the Maltese thronged the bastions and the Upper and Lower Barrakka shouting themselves hoarse and weeping with joy,” says National War Museum curator Charles Debono. The convoy, however, was not only important for the cargo it brought. 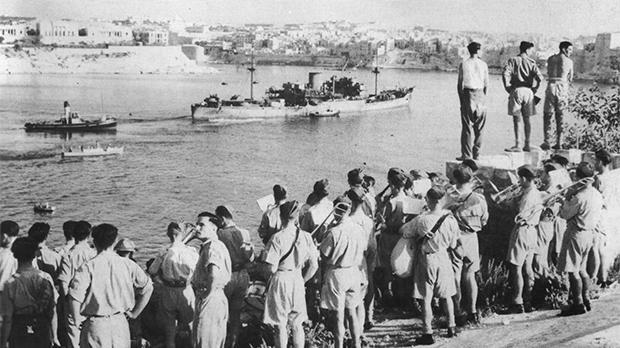 “Operation Pedestal brought not only the much-needed supplies, including food, ammunition and fuel, but it helped Malta regain its offensive role against the Axis convoys plying between Italy and Libya,” Mr Debono points out. Operation Pedestal, known locally as the Santa Marija convoy due to its coinciding with the feast of the Assumption of Our Lady, was the biggest fleet of merchant ships and naval units sent to reinforce Malta during World War II. Malta had been heavily bombarded that year, with April being the worst month. “The island was hit so heavily that the Luftwaffe did not know where to attack further,” Mr Debono says. Over 40,000 buildings were destroyed, including homes, churches, hospitals, palaces and others. More than 300 civilians and 200 servicemen lost their lives while the Axis dropped around 7,000 tons of bombs on the island in one month. Various attempts were made that year to reinforce the country, Mr Debono points out. In March, three merchant ships (Operation MW10) reached Malta from Alexandria, Egypt, but were sunk in the Grand Harbour and Marsaxlokk Bay. Another two attempts were made in June 1942 from Gibraltar (Operation Harpoon) and Alexandria (Operation Vigorous). From the west, only two merchant ships reached Malta, while the one from Alexandria had to return due to the presence of the Royal Italian Navy. The merchant ship MV Rochester Castle proceeds to her berth in the Grand Harbour. Food supplies were fast depleting, and the Maltese were hungry and desperate. “Everyone’s ration was reduced, and the Victory Kitchens were distributing food in such a way that the rations became poorer in quality and smaller in number and quantity,” says the war historian. Despite the failure of two convoys, large aircraft of the RAF and the merchant air service managed to deliver around 60,327 kilos of freight and mail. However, that was not enough. Operation Pedestal’s 13 merchant ships and the SS Ohio carried mixed cargos of kerosene, oil fuel, ammunition, petrol, flour and other foodstuffs. The SS Ohio had held a cargo of 13,000 tons of petroleum products, but actually only 9,514 tons remained in the ship by the time it reached Grand Harbour. “The Axis knew the importance of this convoy and tried in all ways to sink all the merchant ships and the SS Ohio,” Mr Debono says. “Although 53,000 of the 85,000 tons of supplies finished at the bottom of the sea, the remaining 32,000 tons enabled Malta to continue its fight against the Axis. “Everyone assisted in unloading the cargo, and by August 22, all cargo was in safe storage. The supplies were to serve till late 1942. After the arrival of the five ships, the situation in Malta started improving slowly. In the last two months of 1942, two other convoys – Operation Stoneage and Operation Portcullis – were sent to Malta, and these helped lift the siege. By the end of December 1942, some 58,500 tons of general and military stores and supplies and 18,200 tons of fuel had been brought successfully to the island. 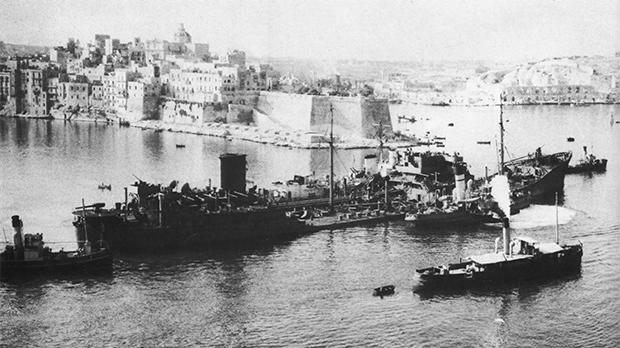 After the convoys, Malta continued contributing to the war effort. “The Axis advance in North Africa was brought to an end in October-November during the second battle of El Alamein. Afterwards, the Axis forces surrendered in Tunisia. The next role Malta played was in Operation Husky, the invasion of Sicily. A large number of warships and troops departed from Malta,” Mr Debono says. Charles Debono is the curator of the National War Museum. He has just published a book on World War II entitled Malta in World War II: The Role of the Island (BDL Books), which includes a chapter dedicated to Operation Pedestal.